With Nowra out of play, Orange was a suitable substitute on Friday, 30th January, for a Winning Double. 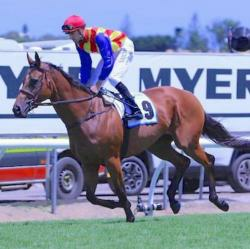 The mare was always travelling well and she was well placed by rider Jess Taylor from barrier 5. She was always strong on the line and paid the healthy odds of $5.80. After her extended initial country spell the "Cow Chaser", looks very well and is as strong as ever. A welcome return to winning form for Normandy Lad after his 11th start in the SUPAGAS BENCHMARK 60 HANDICAP over 1280m. With a couple of gear changes and from barrier 5, The Lad was able to get to the front passing the 800m pole and held his position to win by 0.8 lengths, defeating the local favourite. Again abely ridden by Jess Taylor.